It's Pink Saturday again! Hurrah! My weather is sunny and my outlook is fine: I've had a phenomenal week! So, to celebrate I've made a new background and header set (pink of course) which I'm calling A Kiss From A Rose. If you would like to use these on your blog, go here to download the codes. Here's the latest background I finished - for Joey Ledlie at Antiquemajik, which is my Blog of the Week. 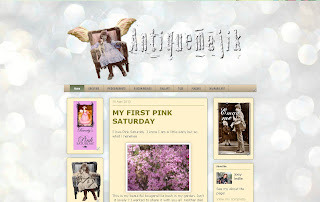 Joey has just joined the Pink Saturday gang, and although it's new, it's a fascinating blog already. She makes dolls, fridge magnets (I have one!) her own soaps, perfumes, all sorts of goodies! Go take a look. Finally, don’t forget to visit Beverly at How Sweet the Sound to see all the other wonderful Pink Saturday posts! Happy Pink Saturday, hurray for sunny weather. dottydot - Wordpress is the WORST to try and customise. However, I've opened another WordPress blog as I am determined to crack the problem. There must be a way without having to spend around £200 on a customisable template! Its fabolous. I like it. Happy Pink Saturday Susie dear. I can't wait to try the new Stretch Background..thanks again for sharing your amazing talents, Susie. 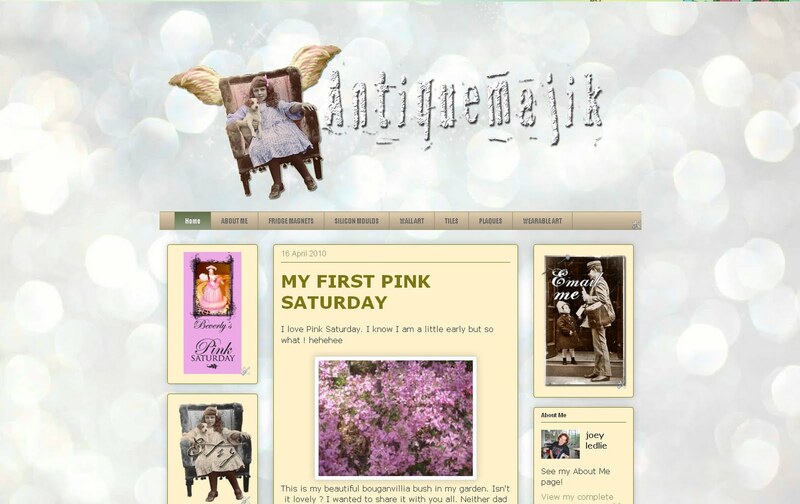 Congrats on your Blog Awards...CC's Blog looks fantastic and she is a SweetSunBonnet Sue for sure. There's something about Gals who are Sue's...don't you think? Happy Pink Saturday, Susie! I visited Joey and she has a wonderful blog. Thanks for your visit and have a wonderful weekend. 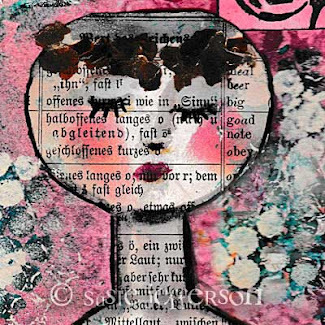 Very pretty pink background Susie! Congrats on your awards and have a Happy Pink Weekend! Have a lovely,sunny weekend,my dear friend!!! We're celebrating with you today! I love the abstract header...very cool, indeed! 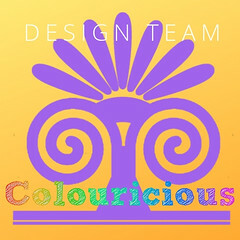 Thanks for visiting and for your comments about my blog design...it's progress! Now I've got to go read your email on how to move those blasted Link gadgets into a post on one of the extra pages...oh, JOY!! I'm so excited over this..NOT! Happy Pink Saturday. Too funny...I started the day by listening to Jack Black sing Kiss from a Rose and here I am visiting your blog now. Your version is much prettier! I've been hunting for a new pink template- I should hire you to design an original for me! Sorry for being here so late today- my son is at the prom and we spent all day getting ready... and who said boys were low maintenance? haha! Congrats on your 300th follower and happy late PS! You always design the cutest things Susie - congrats. on the awards which you certainly are due. Hey, why is there no spell check available on Blogger in Draft? It's really annoying.....good thing I had a good English teacher at Torquay Girls' Grammar - I think I spell pretty good, lol! Wishing you another awesome week Susie. You have a lovely blog, thanks so much for your visit. Mary - I have no idea why Blogger hasn't got the spell check... I think it'll be coming back as there are so many complaints, so give it a little time. Meantime, there's LiveWriter which does have a spell check. Or I guess we'll just have to resort to the good old dictionary. Susie...I haven't been to visit you for PS! Time is flying!!! I am so glad you had a wonderful week. Still working on the house, but it will come to an end for a bit and be somewhat ready to show, and show we will, at the end of next week. Recommended you to Maggie. Hope your air is clear and congratulations on 300 followers!!! Cool!! I just switched to this style!!! Thanks! Congrats on your awards and your followers! I love having you as a go to for my blog stuff! !